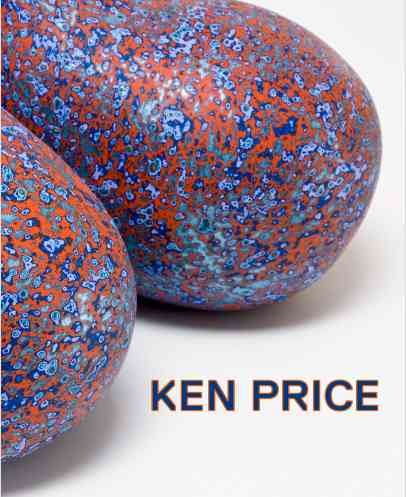 If you want to feel happy, step into the Frank Gehry-designed space at the back of the first floor of the Metropolitan Museum of Art before September 22 to see Ken Price Sculpture: A Retrospective. You’ll find colorful abstract ceramic sculptures that absolutely defy you to smile. Price, a superstar on the West Coast, is fairly unknown here in the East, so it’s nice to get to know him. As a student, he was tutored by legendary ceramic artist Peter Voulkos and then worked mostly around Venice, California (and occasionally Taos) for the next 50 years, producing delightful, collectable pieces, and hanging out with LA greats Rusha, Irwin, Keinholz, Bell, and Bengston. 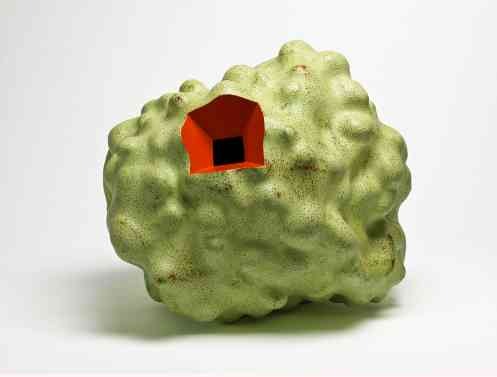 Pastel, 1995, Ken Price’s fired and painted clay sculpture, courtesy of the James Corcoran Gallery. © Ken Price. Photo: © Fredrik Nilsen. The show begins with Price’s most recent work and works back through time, so you’ll encounter some of the larger, crazier, colorful pieces right as you walk in. Some of the ceramic surfaces of look pebbly and coarse, but this is right where Price worked his magic. He painted coat after coat atop his fired pieces, and then meticulously sanded it all down to make a silky smooth surface. You really can’t tell unless you’re eyeball-to-eyeball with the blob sculptures, but the cover of the catalog (top left) gives you a hint. This experience suggests the type of fun, contemporary shows that The Met will mount when it takes up residence at the Whitney’s building on Madison, once that institution decamps for the High Line in 2015. Take 3 minutes to let curator Stephanie Barron walk you through LACMA’s installation earlier this year, which is pretty much what you’ll experience on Fifth Avenue. She tells you a little about Gehry’s gallery approach and talks about her relationship with the fun, fabulous Ken Price. Enjoy the spin, and get over to The Met for some real California fun. This entry was posted in Art, Museums and tagged architecture, arts, design, museums, video by mssusanb. Bookmark the permalink.